Plantation shutters are window shutters with horizontal slats that can be tilted open or closed. The slats are set in a hinged panel which will allow you to fully open the shutters when desired. They are a very popular window treatment for those who wish to add a touch of elegance to their home. The wooden shutters also give ventilation, light, privacy, and soundproofing due to their louvered slats. These shutters are available at competitive prices in a lot of stores online. You can also customize your windows and choose to have shutters on the bottom half of your window only – also called cafe style. Or you can have the option of having multiple panels which allow you to open the top half while keeping the bottom half closed. Plantation shutters can be custom fitted to any window shape or door. This kind of shutter was originally designed to offer great privacy but they are now also used as a design statement as they add a touch of elegance to a home or office. Versatile and Customizable. Some companies offer a custom fit the shutters to your window opening making them more energy efficient compares to other window covering options. Plantation shutters can help you reduce your energy bills by lessening the amount of cooled or heated air from leaking from your windows. You can also opt to have shutters that open only halfway if desired. Reasonably Priced. Today, the average homeowner can enjoy the affordability of plantation shutters compared to yester-years when they were so pricey that only the elites can have them in their homes. Very Functional. 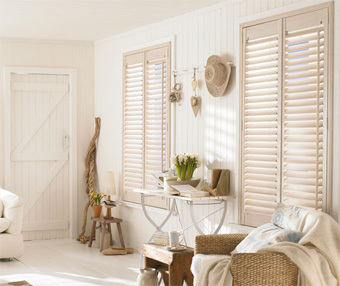 With plantation shutters, you can control the light as well as the view through your windows. A good insulation barrier is created, trapping unwanted temperatures and minimizing your energy bill when all the louvers are closed. Elegant Appearance. The classic yet modern look gives elegance like no other window covering can. Whether your shutters are painted or just in its natural wooden finish, they all have an appearance that says “Welcome Home!”. Here’s another link if you want to be more precise with the window measurements: http://www.horizonshutters.com/shutters-price?